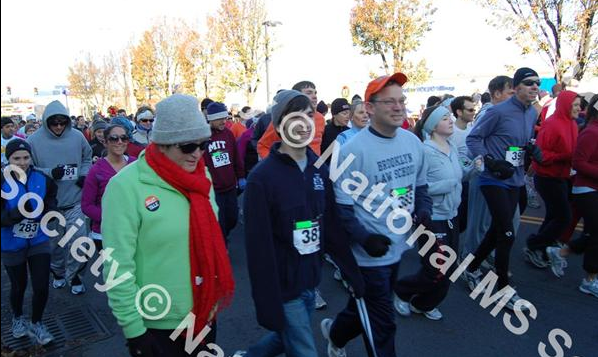 Last year, I ran a 5k for MS on Thanksgiving Day… this year I wanted to do it again. Unfortunately, I managed to catch two mega colds this month that just wouldn’t quit. I feel like I’ve been super sick for almost the whole month. Both were respiratory so I just couldn’t imagine running. I haven’t run at all in the month of November, total bummer. 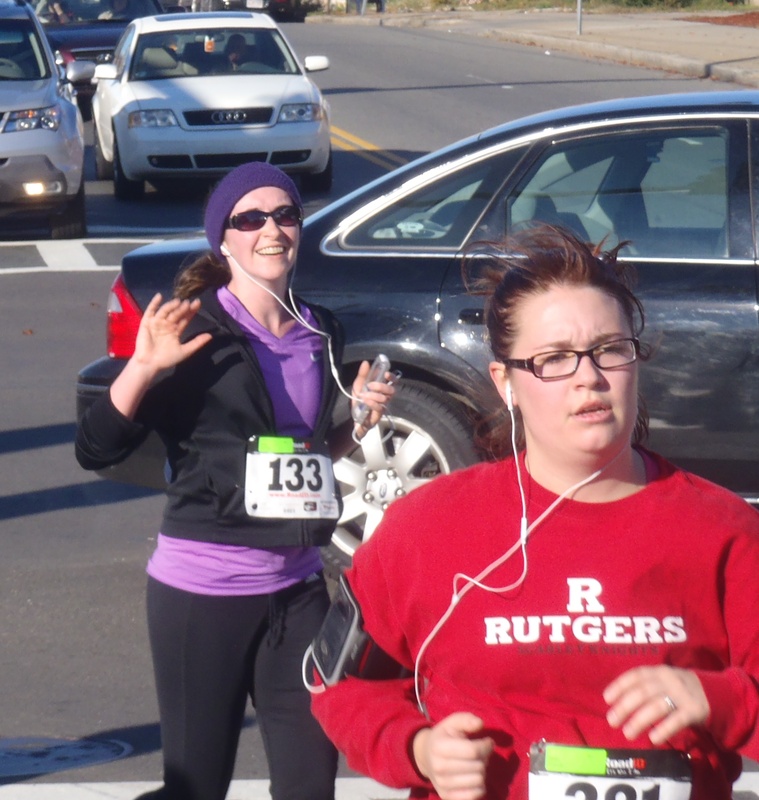 Why did I want to run this race so much? Thanksgiving races feel a little different. Like everyone is a little extra jovial. MS means something to me. 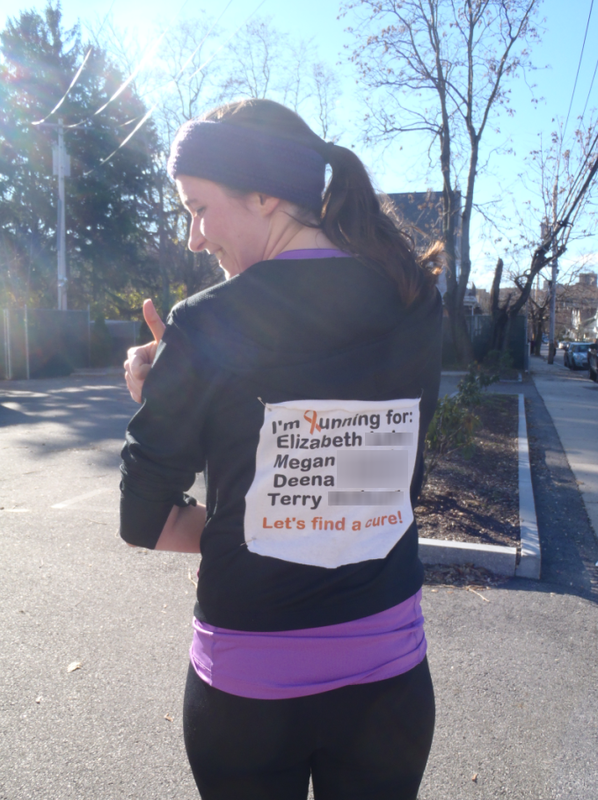 Last year I ran with the names of people I know with MS on my back. I planned to do the same this year. I’ve also learned about more people in my life affected by MS and I wanted to add the names of their loved ones with MS to the list on my back as well. I may not know the loved one with MS, but it affects my dad/friend/boss/co-worker and I want to offer the little support to them that I can by offering a little nod to their loved one. I blurred their last names, just in case they might prefer that. This was taken after the race. I felt terrible not making it to this run: even though the course is absolutely the worst one I’ve ever encountered, the cause is so worth it. All day on Thanksgiving, I thought about those in my life dealing with MS. Every year, I give thanks for my health, and it just makes me sad that they can’t… I really hope some day they can! So when my friend posted on Facebook that she was thankful for this study, curing a mouse of MS and giving her real hope for the first time in a while… well, I may have actually teared up. Good luck to everyone dealing with MS! I hope this cure in mice is able to be replicated on human cells so that you have a cure someday in the near future! And next year, I look forward to being back on that course trying to help the cause! Hi all, I’m so sorry for being away so long! The end of the semester mixed with the approaching holidays mixed with college application deadlines has led to me feeling completely overwhelmed. I haven’t even gone running since Thanksgiving! My run went pretty well though! I mentioned before that I’m not a morning person and I was worried about eating and drinking enough. My alarm went off at 7 am. I hit snooze. My alarm went off again sometime after that (for some reason my alarm doesn’t do the standard 9 minute snooze… it will range from 9 minutes to 30 seconds, I’ve never figured it out). I hit the snooze again, drank a pint of water, and ate a banana that was waiting for me on the bedside table. I ate it with my eyes closed… but I propped myself up on an additional pillow, because that makes eating in bed/asleep acceptable, right? I may have hit the snooze again… and got out of bed at 7:30. I ate a yogurt and had another bottle of water. I got ready and got rid of some of that water before leaving the house. Of course right after I got there and checked in, I had to go to the bathroom. 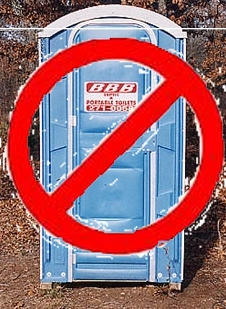 Here’s a fun fact about me, dear readers, I will NOT use a port-o-potty unless it’s absolutely necessary. Lucky for me after the running started, the feeling subsided, but I certainly regretted drinking that much water before the race. The race itself was ok. I have no idea where the start line actually was, it wasn’t really marked. I put myself to the back of the line and ended up having to run around an ambulance parked in the middle of the street… so I’m guessing I was a good distance away from the start. This race didn’t have a “net time” like the last one, so I’m guessing it took at least 30 seconds to get to the start line… and I’m totally guessing that because it means my time improved from the last one. (actually, after looking at the hundreds of other people who crossed the start line before me – in the professional photos – it might have taken me 90 seconds to make it to the starting line just like the first race). I wish this race had pace signs to figure out where to start (start here if you have a 5 minute pace, 6 minute pace, 10 minute pace, etc), like the last one did. Other comparisons with the last one include: there were no mile markers here which was a bummer, and no one told me at the half way point what my time was. Oh well, no big deal. I made it though! Even with the hills and it being cold! There were a few points where I seriously thought about walking. I had the names of the people I know with MS on my back (shown below) and it really helped motivate me. It was like they “had my back” or were pushing me from behind… these were the images I thought about to keep me going. At one point, I was thinking about walking and thought “Well, Terry would understand.” (Terry is in a wheelchair.) But then the other half of my conscience reminded me that Beth would not have approved! So even thousands of miles away, she motivated me to keep going! 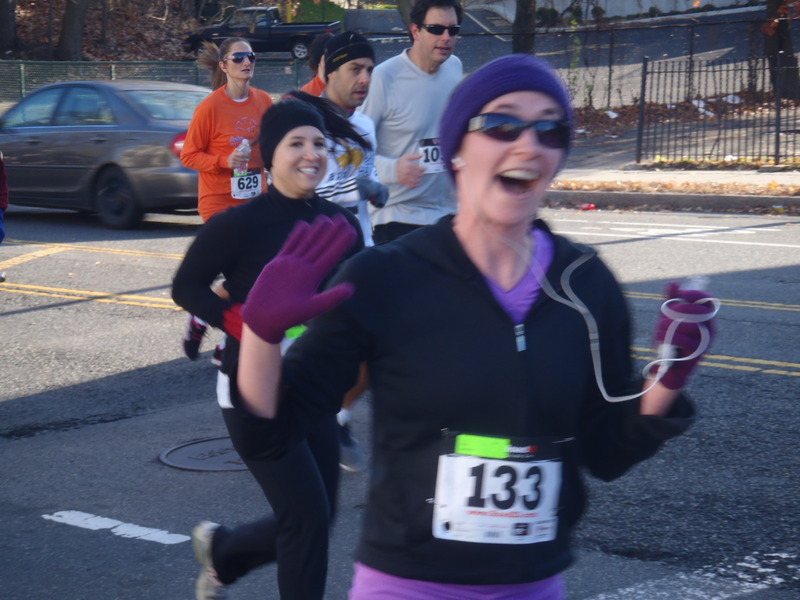 Mile 1, he didn't see me coming... so it's a little blurry, but clearly I wasn't tired yet. Around the 2.75 mark. So glad I had people cheering for me at this point! I really like reading joggingjeans.com’s blog and really wanted to contribute to it. But alas, neither of us saw anyone running in jeans. However, when I looked through the professional photos, I found this! It’s at the start line, so he’s not really running yet, but he’s in jeans and he’s wearing a number! I achieved my goals of: finishing, running the whole time, I finished in under 35 minutes, and even though I don’t know my net time, I’m still betting that I beat it.